Hope for life renewed. Hope for mans relationship with nature. Hope for the changing seasons. The loons hauntingly beautiful call, for me, signals the beginning of another summer on the lake. A safe place to rest. 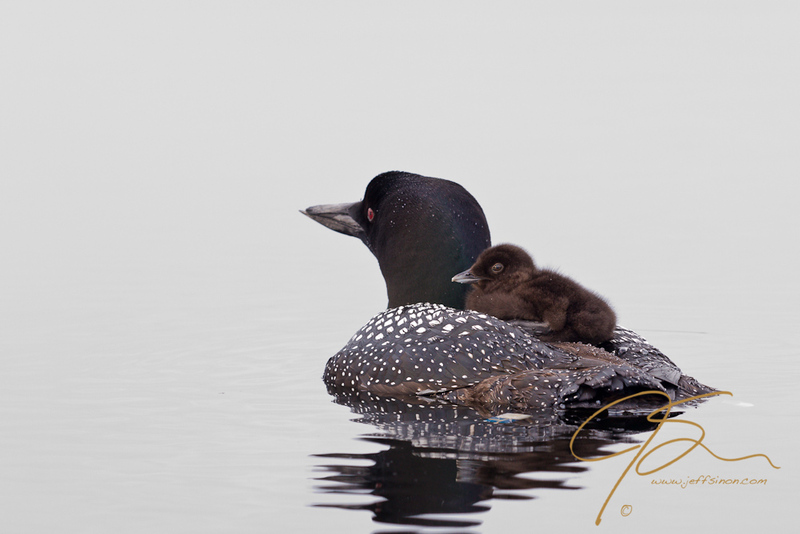 A loon chick seeks comfort and safety on its parent's back after a mornings feeding. I have to say that is one of the most beautiful photos I have ever seen. It almost looks like a painting! Well done!! I think that is one of the nicest things anyone has ever said about one of my photographs. You just made my day! I meant every word! You could easily sell that photo!! Thank you again. That is what I’m hoping for! Oh I do hope that loon chick grows up to be a big loon! What a brilliant picture! You and me both! Thank you for the compliment. As always…you are an amazing photographer. Very nicely done! AWwwwww … so cute and the baby looks fluffy. I love the clarity of the photo. Very cute indeed, thank you. That is a fabulous photo! I never knew that chicks rode on their mother’s back. That photo is a gift, Jeff! Thank you for sharing it with us. Thank you Anne. I have always known the chicks rode on their parent’s back, but wondered how the parents dove while the chick was on their backs. The parent just dives right out from under the chick, leaving the chick just floating there. It was kind of funny the first time I saw it. Thank you very much Jo. I appreciate yours and all others, wonderful comments. breathtaking. a beautiful photograph of hope. thank you for sharing this priceless moment. a very cool click indeed. Thank you. I felt honored that the adults were comfortable enough with my presence to allow me to capture this moment. What a sweet moment. And a stunning shot, too. What a gorgeous shot! Great capture of the sentiment of hope. Love it. I’m very glad you like it, thank you. On my first visit to your site, I am rewarded with this beautiful photo of the loons. They are very special to us, too, in Minnesota. A great shot! Thank you for the visit, and the compliment. I look forward to the loon’s return to our lake every year. I’m not much of a birder, but the loons are one bird I actively pursue with my camera. At a respectful distance of course. an absolutely beautiful photo. so peaceful, so gentle and full of hope. I love the colours, the composition. I am glad that we can see the loons eye. love it. Thank you very much, and thanks for stopping by. A loon chick on an adult’s back shot was high on my “bucket list” for loon photos, and this past summer I was able to finally cross it off. Your patience definitely paid off! Absolutely stunning photograph!